Nominations are now open for our first Ethics in Business Awards. REMINDER! - The Deadline for applications is December 31st. This is our opportunity to recognize businesses and non-profit organizations in our community that reflect Rotary's values. Follow this link for a fillable pdf. It is a simple application and you are encouraged to nominate businesses and non-profits that you are familiar with that enrich our community. You can also forward this to others who may want to nominate. The nominee does not need to be a Rotary member or a Chamber member. Our awards will be independent of the Chamber's Excellence in Business Awards, although we will share the event with the Chamber. Our Rotary meeting will be held with the Chamber on January 25th 11-1 where the awards will be presented. Our selection committee includes President Elect Larry Schwartz, Roy James and Steve Brown. Thanks to a generous donation from Carlos and Diane Noriega, we have over 900 dictionaries. That is enough for every 3rd grade classroom in the Centennial and Oregon Trail school districts. This is a wonderful opportunity to get involved in helping students in our community by giving them a gift of pride and joy in their learning. Be sure to congratulate one of our newest members, Steve Brown. Steve was honored last week by Mt. Hood Community College among 50 outstanding alums as part of the college’s Fiftieth Anniversary. 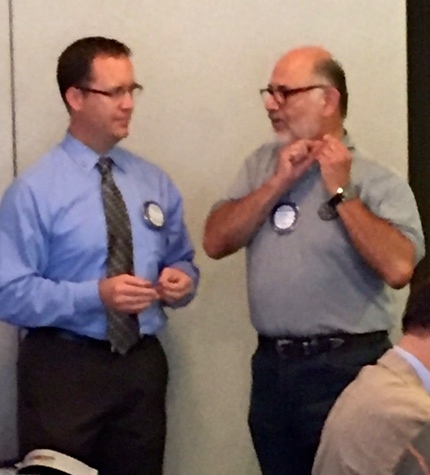 Steve joined Rotary in August and is one of our newest members. Steve is pictured here with his wife Shannon and Pres. Diane, who also serves on the MHCC Foundation Board of Trustees. 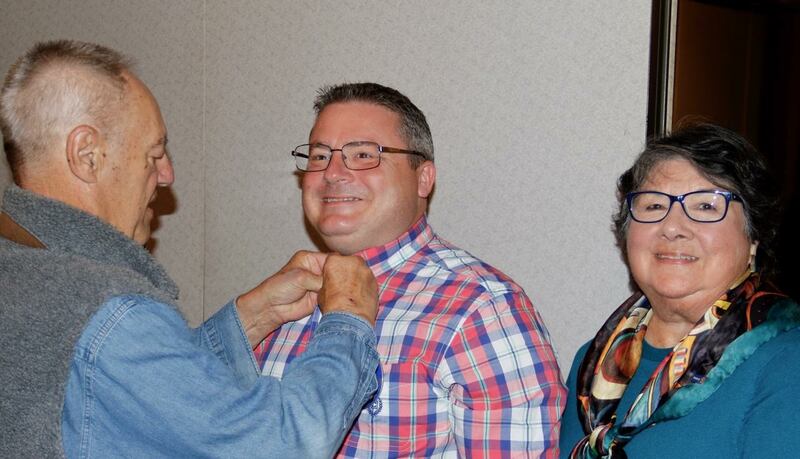 Meet our newest Gresham Rotarian, Paul Coakley. Paul is an east Multnomah County native who attended Gresham elementary and high schools. He is married to Shante and has three children: Azaria, Paulie and Samia. Paulie the 4th no only shares the same name but almost the same birthday…June 22 and June 23 4 minutes apart. Paul’s hobby is collecting sneakers…he has over 60 pairs including rare Jordans, Nikes and Adidas. As you all may know, Paul is the new superintendent of Centennial School District, the 21st largest in the state. He follows Sam Breyer, who will be the new superintendent of the Multnomah Education Service District. Paul began his career in 2000 as an elementary teacher in Portland, throughout his educational career he has held multiple roles: Teacher, Literacy Coach, Student Management Specialist, Elementary Principal, Assistant Superintendent and now Superintendent. Dr. Coakley has a proven record of competence, commitment and leadership skills in improving student growth and achievement outcomes in public schools. Last Wednesday Gresham Rotary presented a Paul Harris award to Al Goetz’ wife, Bettianne and his daughters, Deborah and Jill. Al left us last year and the club wanted to honor his memory. The members donated The Rotary Foundation for a Paul Harris award in his honor. 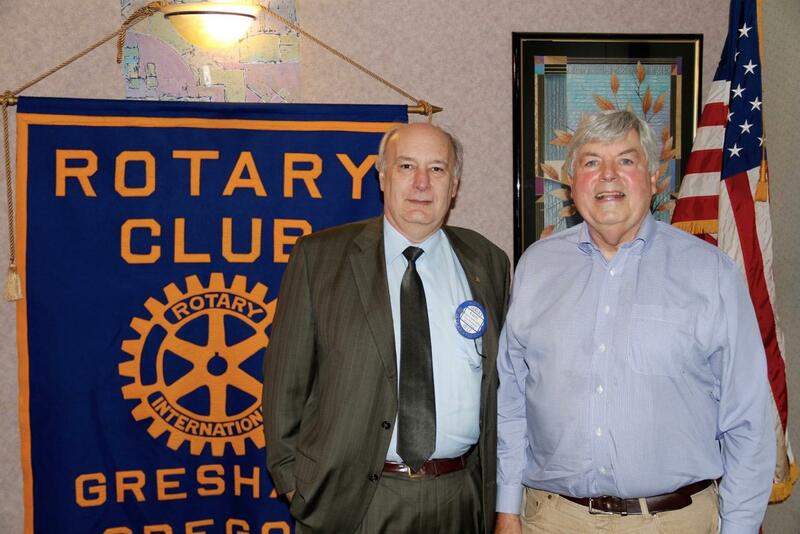 Al joined Gresham Rotary in January of 1992. He served the club on the Board of Directors. Al was awarded the status of Honorary Rotarian when he retired. He lived on Interlachen Lane, Blue Lake with his wife Bettianne. He was an inventor and innovator. As a member of Gresham Rotary, Al and Bettianne traveled worldwide and hosted international guests through the Rotary Club's International Fellowship Exchange. He was a fine businessman, a great guy, a wonderful Rotarian, a true family man. He will always be in our hearts. Gresham Rotary's 63rd Annual Steak Fry was a roaring success. We had a record turnout and we are still counting the "pennies" to see how much we are going to put into our scholarship fund this year. Preliminary numbers from John Clark indicate that we will net at least $22,000!! We had so many wonderful guests on hand who enjoyed their steaks, had fun with the bucket raffle, and enjoyed seeing their friends and neighbors. Thank you Gresham community for supporting Gresham Rotary and our work to help our high school students to pursue their higher education right here at Mt. Hood Community College. A huge thank you to Chuck Hawkins and his team; John, T.J., Dex, Debbie, Claudia, and Debbie. They did an awesome job! Please keep an eye on our facebook page for pictures and more information. 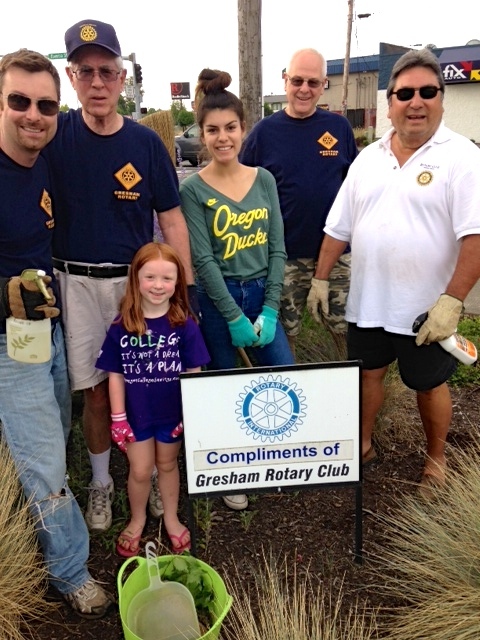 Gresham Rotary is thanked for helping with the Jalanese Garden on Tsuru Island. 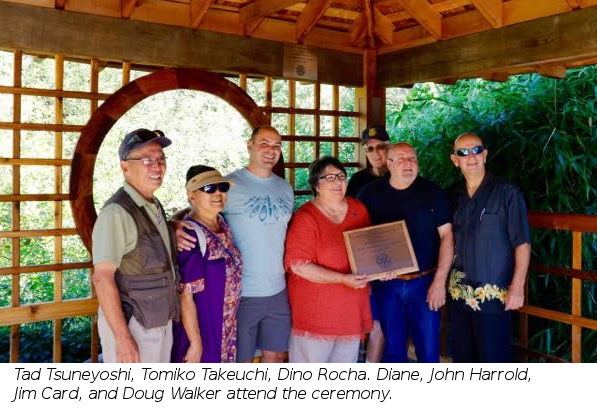 A permanent plaque thanking Gresham Rotary for our support for the restoration of the bridge and providing on-going help with the maintenance of this beautiful little park was place at the Tea House in the Japanese Garden in Gresham’s Main Park. Tomiko Takeuchi has been instrumental in the creation of this special place and Jim Card is the lead person for the garden. 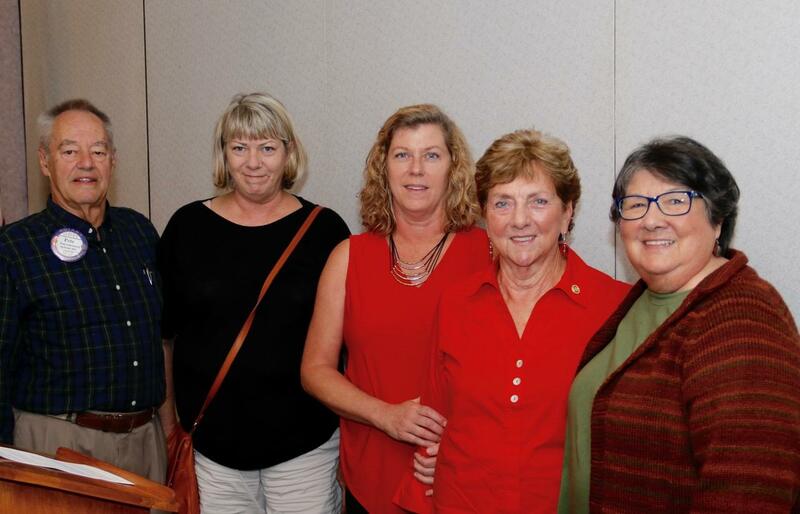 The West Gorge Rotary celebrated their 10th anniversary on August 26. 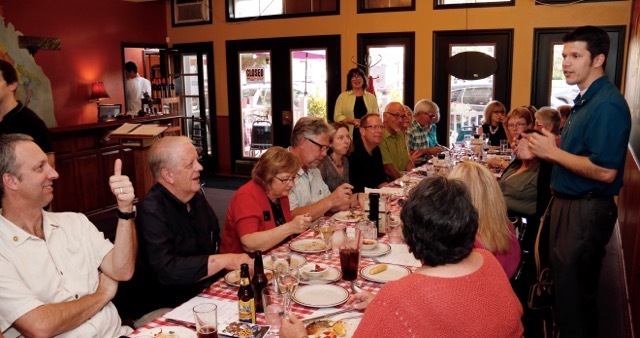 Gresham Rotary sponsored a new Rotary Club, The Rotary Club of West Columbia Gorge. 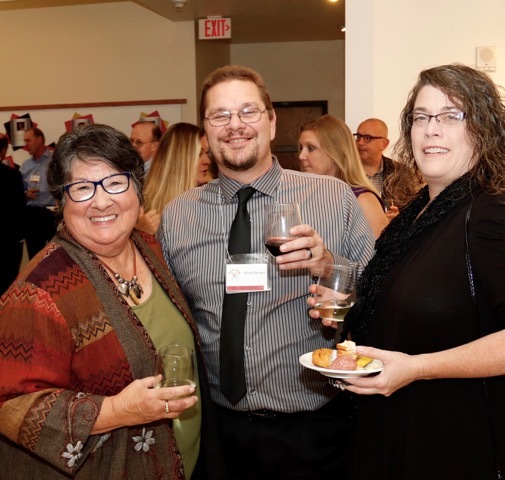 President Diane and Carlos attended the festivities last Friday. West Gorge President Greg Dirks spoke about all the accomplishments of their club over the past 10 years. 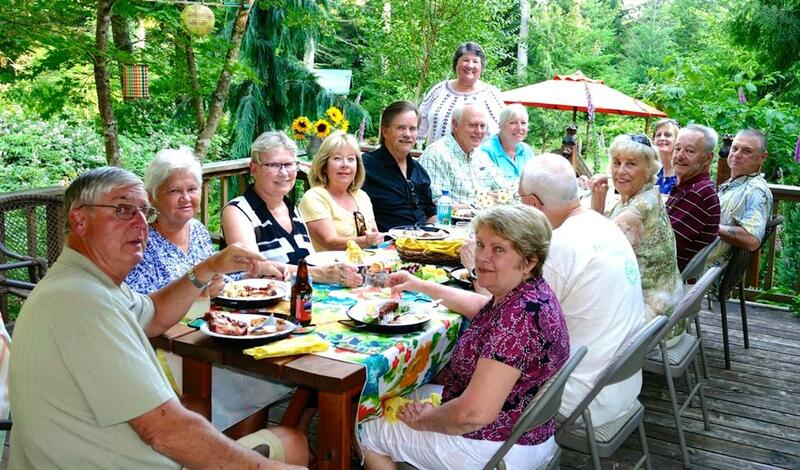 West Columbia Gorge Rotary is a small club but a mighty one. They award scholarships, built a gazebo in a city park, co-sponsored a peace conference with Mt. Hood Community College, led a “Rough Writers” project with Roosevelt High School. They are a 100% Paul Harris club. Congratulations West Columbia Gorge Rotary on this milestone! 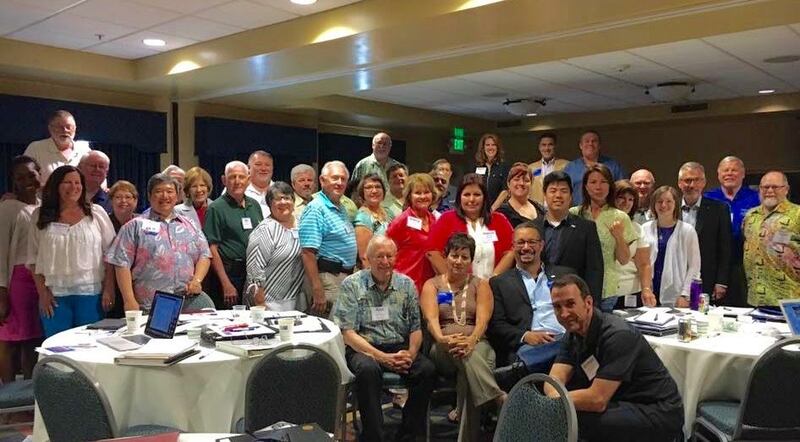 President Diane spent a couple of days in Sacramento with District Membership Chairs from all of Zones 25 and 26. They came from Arizona, California, Hawaii, Oregon, Washington, and even from Canada. We received briefings on all the latest resources on membership development from Rotary International and the Zone. Several of our membership colleagues presented new and innovative ideas for building membership, including Joint Ventures and Passport Clubs. New ideas will be coming to clubs soon. Here are some highlights from the August 8th board meeting. Some of the subjects covered include Membership, filling a board vacancy, Community Appeals, and whether and how we might change our bylaws. Members having questions on these or any other topic remember to contact a Board member or President Diane. 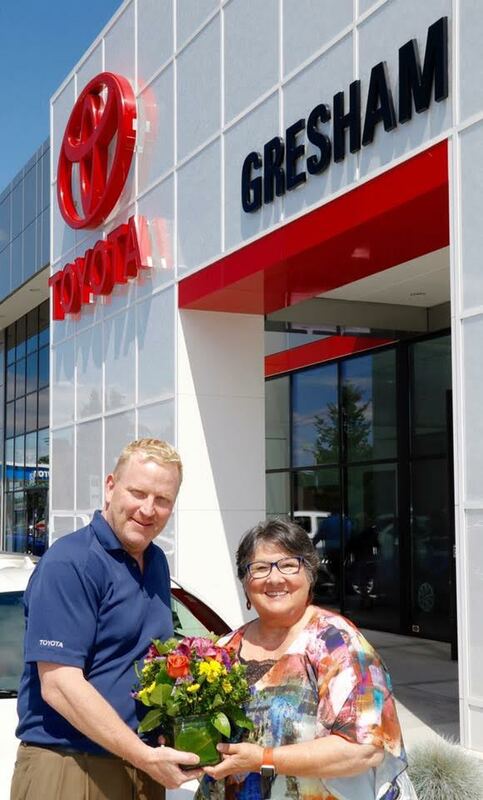 Gresham Toyota has signed on as the first naming sponsor of the 2016 Rotary Steak Fry. 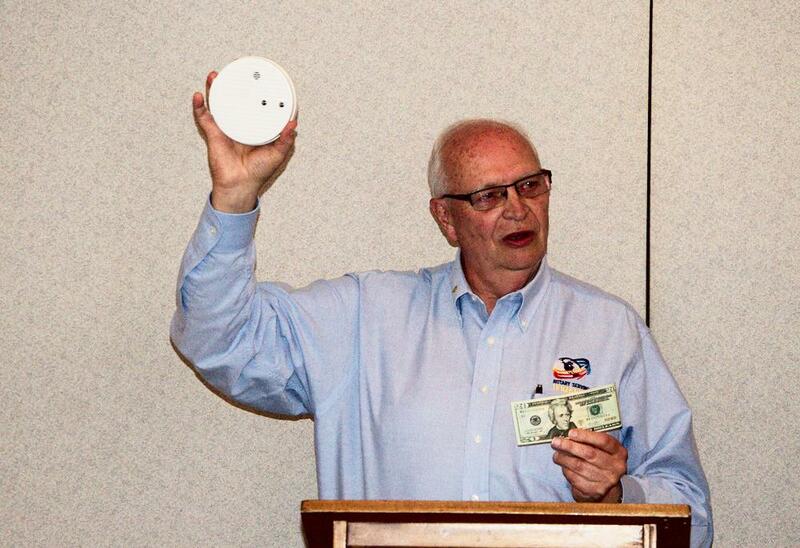 Held on September 14th at Mt Hood Community College, the Steak Fry is one of Rotary's two major fund raising events. The funds raised at this annual event are earmarked for scholarships for local high school students to attend Mt. Hood Community College. Bill Jame s, The General Sales Manager, receives a thank you from President Diane. We are grateful to Gresham Toyota, and our other sponsors for their support of this important event. Those interested in other naming sponsorships, to be a table sponsor, or to for tickets should contact event co-chairs Chuck Hawkins or Dexter Hill. First a reminder that the people we touch may be people we don't even know. But they know us, because of what we do. And what we do is change lives. We change lives both locally and in the world community. $5 means dictionaries for third and fourth graders . . . sometimes the first book they can call their own. $50 means sanitary drinking water for an entire village. Rotary joined with KaBoom, Forrester Financial, and other community volunteers in a one day build to assemble and install a playground at the Rockwood Salvation Army Campus. 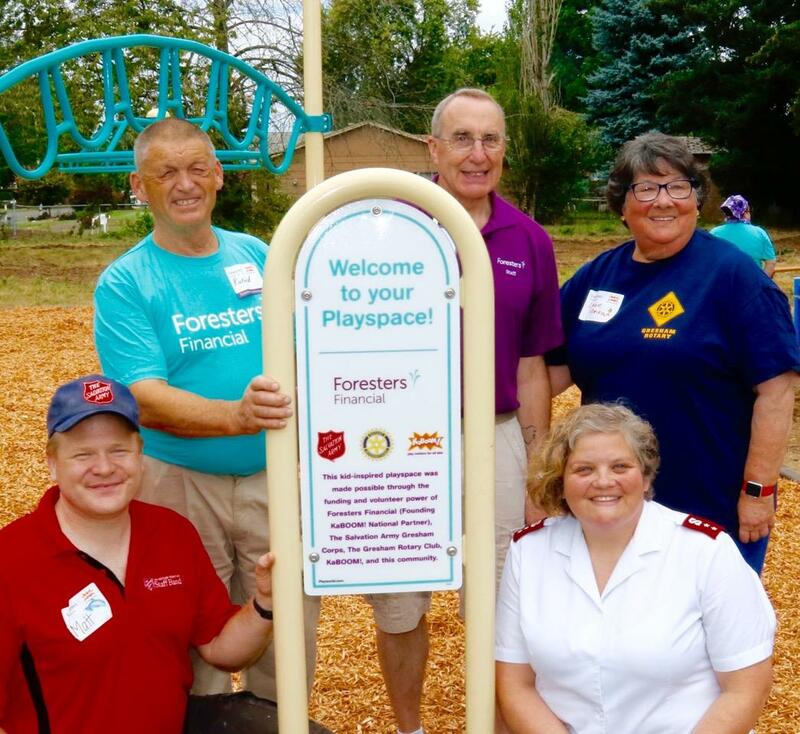 President Diane, Captain Matt Madsen, from Salvation Army, Jim While, Member Coordinator from Foresters Financial, and and Captain Dianne Madsen, Salvation Army installed the sign recognizing the partners who contributed to installing this playground, the 2790th KaBoom playground. Thanks to the members who were able to attend this event: President Diane Noriega, Dino Rocha, Carlos E Noriega John Harrold, John Clark, Patton Echols, Teresa Bright, Roy James, Tom Graves, Tad and Toshi Tryuneyoshi, Robin McGregor, Brian Freeman, Alden Stevens. Miss anyone? 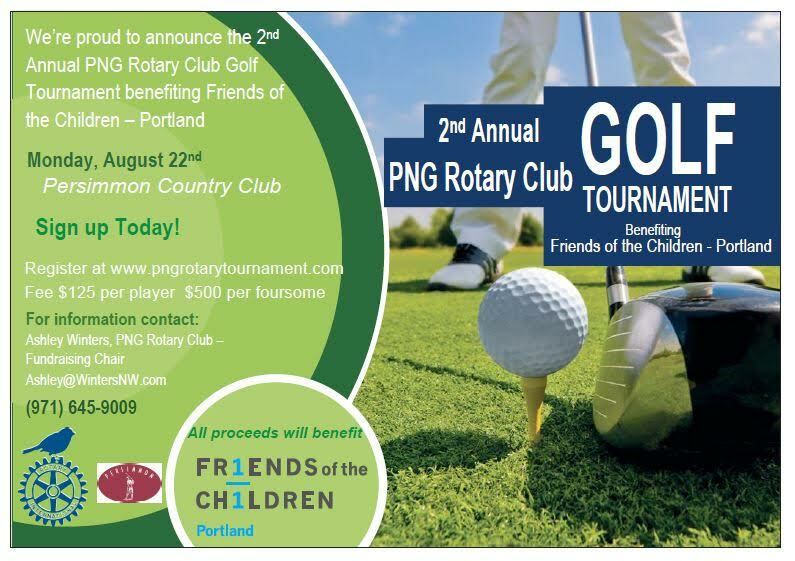 Portland New Generations golf tournament is Monday, August 22nd. Player and sponsor slots are still available. For more information, see the flyer below. 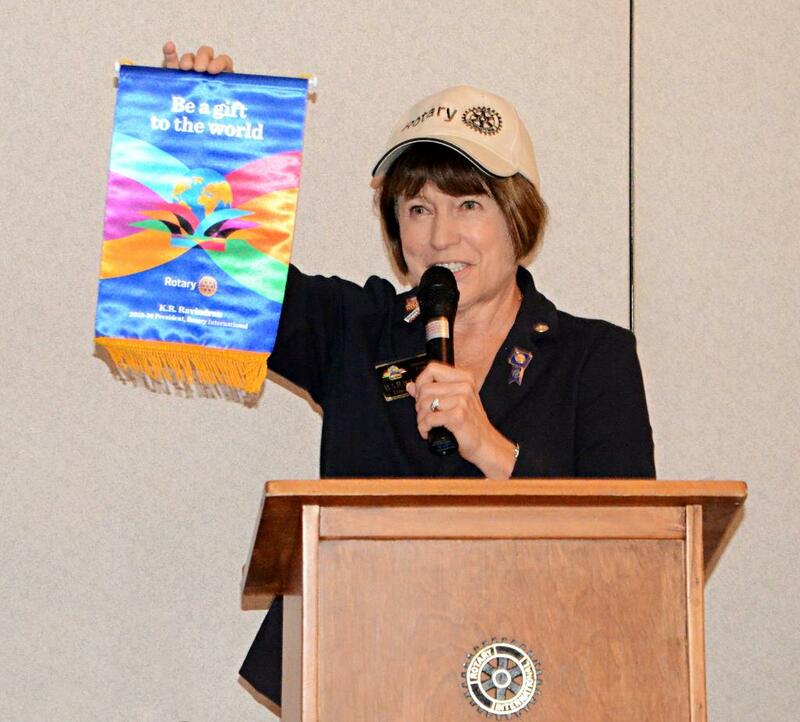 District Governor Barb Crozier visited the Gresham club on September 30th. After making her annual district award, DG Barb shared some thoughts and new thinking around branding, getting out our message and Vocational Service. One of the keys to expanding our opportunities for service is letting people know who we are and what we do. To assist in that effort, RI has updated the official Rotary logo. Instead of the Rotary wheel alone, now the word Rotary is included in the logo. DG Barb sported the new logo in her golf cap that was featured in her remarks. DG Barb also challenged the club to sharpen our “elevator talk” about what Rotary is and does. The suggested approach is to center our statement around three phrases – six words. When talking about Vocational Service, DG Barb reminded us of how Rotary got started. A story familiar to many Rotarians, Paul Harris and three other Chicago businessmen began regular meetings that rotated between their places of business. Like the first Rotarians, DG Barb reminded us that many people initially join rotary for the networking opportunities and to support their businesses. While we stay for the friendship and service projects, it is worthwhile to celebrate out member's vocations. 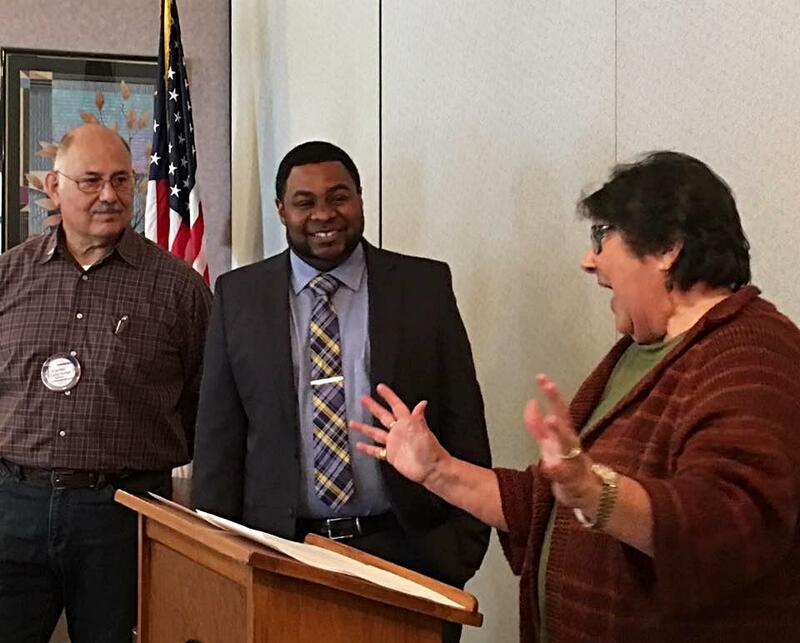 Modeled after a program that began in Ireland, Rotary Clubs in district 5100 are participating again this year in a peace initiative to bring Greek and Turkish Cypriots together. Greek Cypriots and Turkish Cypriots are paired to spend a month in classes and social experiences with their host families. Professors Harry Anastasiou, a Greek Cypriot and Birol Yesilada, a Turkish Cypriot at Portland State University, both active Rotarians, launched the program several years ago. While this is not a Rotary sponsored program, all the host families are Rotarians within District 5100. The students have classes in conflict resolution, team and trust building activities, and public speaking. Elif and Eleni are staying with Sue Coates, former Assistant Governor and currently Rotaract Chair for the District. On their way back from Mt. Hood on Friday, they stopped off to visit the Noriega's. Carlos and Diane had plans to have dinner at Mojave and invited them to come along. 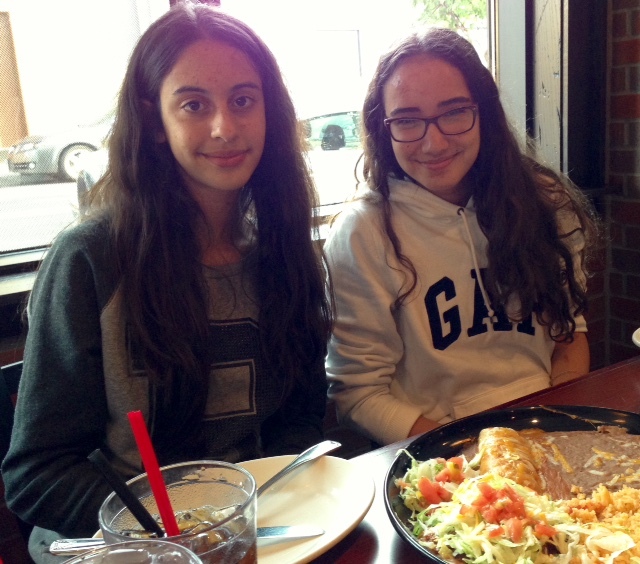 This was their first experience with Mexican food. Diane ordered a selection of typical Mexican dishes, hoping they would enjoy them. The girls were really open to all the new flavors and finished off the whole platter! They have only been here 8 days and already are giggling and sharing like BFF's. They exemplify the purpose of this program, which is to show that people who have been in conflict for many years really have much more in common than they have differences. When they return to their home country they will be called on to do public speaking at schools and in their communities. These girls can be the harbingers of peace for the future. Past RI Ray's chance on preserving Rotary when he encouraged Rotary clubs to be Bigger, Better, and Bolder. The intent was to encourage clubs to improve attracting interest in Rotary by encouraging clubs to make Bigger impacts in local communities. PRIP Ray risked his influence by deviating from past practices. RI President Ravi is rolling the dice to preserve Rotary by dropping past membership net-gain goals by encouraging clubs to improve membership retention by 1%. For most of Rotary's history, membership in Rotary was by invitation only - which depended on the most influential public relations in Rotary's niche market: word-of-mouth. Past leaders took a chance and established net-gain practices measured at arbitrary cutoff dates and continually encouraged clubs to recruit members. Recruiting kills niche markets and has organizations forever remembering past glories as they travel an Alzheimer-type path to the Organization Cemetery. Presidents that followed PRIP Ray repeated his successes. RI President Ravi's roll of the dice began measuring clubs' effectiveness on their abilities to retain members - a major improvement. This success is yet to be measured. RI President-Elect John Germ will no doubt study and learn from the chances past presidents have taken, which will improve the chances of the risks he takes becoming successes. Rotary drivers for Meals on Wheels should arrive at Ambleside Center on Wednesday at 10:15 a.m. to deliver 6-12 meals in approximately 1 hour. As soon as you arrive, sign in and put route #18 ( new route) on the ready board. Check your prepared meals against the route sheet to determine the correct quantity was packed. Communicate with your fellow driver to coordinate your arrival time. Contact Larry Petersen if you have a scheduling conflict. Gresham Rotary Foundation is holding its Annual Steak Fry on September 19th. Tickets are on sale now for $25 from any Gresham Rotarian. The funds go to high school students form Gresham, Barlow, Centennial and Sandy High School to attend Mt. Hood Community College. The scholarships provide $1500 a year for two years to help with the cost of tuition. We currently have 13 students attending Mt. Hood thanks to those who support our fundraising effort. Members can help the Secretary maintain our records if you update your profile on the Club Website. It may have been sweltering all over town on Saturday, but it was a perfect evening for a BBQ at Gato Loco Lodge. The lucky Rotarians who signed up for the Noriega's Annual BBQ were treated to a yummy dinner of ribs, chicken, potato salad, spinach salad, baked beans, and peach cobbler. No one went home hungry! The best part, of course, is the wonderful friendship of Rotarians enjoying a relaxed social setting. Recovering from his recent back surgery, Ken came out with Teresa. Shelly recovering from the shock of her recent auto accident (she was not hurt but her car was totaled) was there with Dexter. It was great to see Jan Tutt again this year with Tom. Claudia made it out of work in time to join us. We look forward to hosting this BBQ every year! Thank you to Doug Walker and his Landscaping team at the Small, Gresham Rotary Park at the NW corner of Burnside and Division Street in Gresham. Glen Akers and his little helper, John Harrold, Chuck Hawkins and Bob Avila and his granddaughter (a future Oregon Duck). We accomplished an amazing number of projects this year thanks to the hard work of our club members and the money raised. We raised a record amount of money with our three fundraisers this past Rotary year. We raised $34,000 at the Golf Tournament thanks to the hard work and leadership of the three co-chairs; John Harrold, Tom Tutt and Bruce Howard. The Steak Fry, under the leadership of Naomi Ulstead and her committee brought in $17,000. And this spring with Sue Piazza’s hard work we brought in $13,500. All these events allowed us to send 50 kids to YMCA Camp Collins. We awarded $13,500 in scholarships to high school seniors, including Springwater Trail, a new high school for us this year. We shared $5000 with Birch Community Services from the golf tournament proceeds. We delivered over 850 dictionaries to students in Centennial and Oregon Trail School Districts with Debbie Hushbeck as our Literacy Chair. We also did a book drive to send books to the Philippines to support a literacy project organized by Rotarian Scott Hansen and his wife Cathy, who are on an 18 month mission there. We are donating $5000 to various local non-profits as part of our Community Appeals Program, headed up by Mike Miller. We stepped up with a couple of “instant fundraisers”. We donated $2000 to ShelterBox, enough to send two Shelterboxes to Nepal. Last week our generous Rotarians raised $8500 to partner with the Salvation Army to build a playground for needy kids in our community. We allocated $1000 from the Gresham Rotary Foundation funds to help with the renovation of the Japanese Garden. Our club members, primarily John Harrold, Tad Tsuneyoshi and Bob Avila have been working on Saturday mornings on this project. 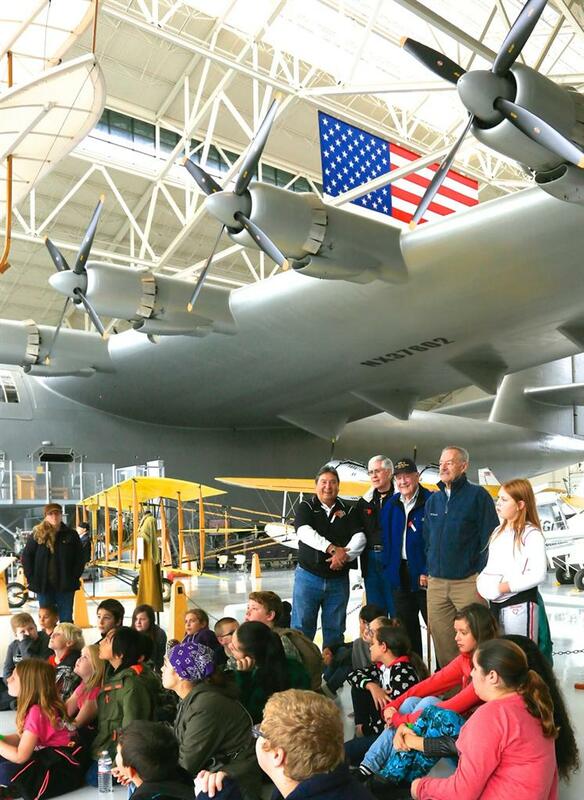 Speaking of Bob Avila…..Bob organized a field trip for about 30 kids from My Father’s House to The Air Museum. He was able to get a bus, driver, and lunches donated and highly discounted tickets. The club chipped in $300 to make up the difference. The club continued with our long term annual commitments. We have cleaned up the small park regularly, continued to plant and maintain trees in Gradin Park, and cleaned up Camp Collins. We provided Christmas for 12 families this year, adding two more when more funds were identified. We continued to deliver Meals on Wheels every week. As usual, we rang the bell during the holdiays for the Salvation Army. Thank you to each and every Gresham Rotary Member for all the outstanding work that you have accomplished this year! It was a very good year. On Wednesday Gresham Rotary held its Annual Scholarship luncheon welcoming this years scholars, their counselors and their families. 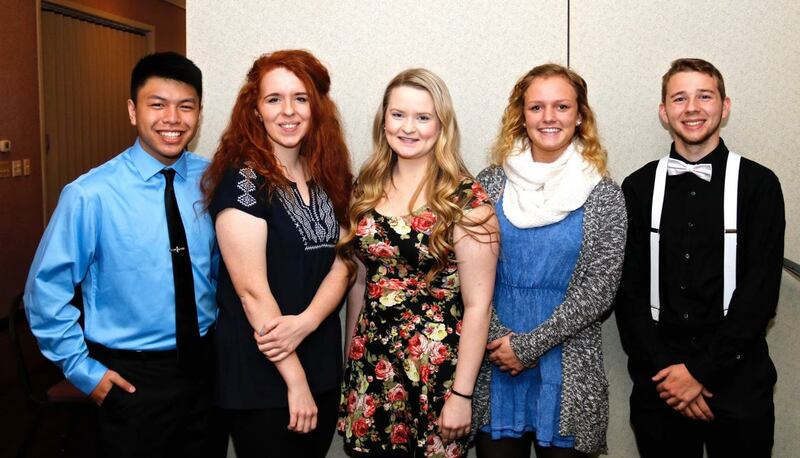 Gresham Rotary Awards a scholarship to a high school senior headed for Mt. Hood Community College from San Barlow, Gresham, Springwater Trail, Centennial and Sandy High Schools. The award is for a total of $3000 per student, which they will receive over two years at $1500 a year. Chris Karn from Sam Barlow High School. His area of study is manufacturing and engineering. He has volunteered at CAL as an Ambassador. He also tutors math and reading. He is already gaining experience working in machining. Maiya Letz is graduating from Springwater Trail High School. She will study Criminal Law at MHCC before transferring to Western Oregon University. The first in her family to go to college, she hopes to start her career as a paralegal and then receive her law degree to work as a public defender. She volunteers in a kindergarten classroom helping the children and the teachers. Carly Petesz is graduating from Gresham High School. She is going to complete the transfer degree program at MHCC and then complete her degree in Occupational Therapy at Eastern Oregon University. She has volunteered at Courtyard Fountains Retirement home assisting elderly residents. Torrey Rund will graduate from Sandy High School. Her goal is to become a nurse. She has already gained valuable experience as a volunteer running the Red Cross Blood Drive and volunteering at Legacy Mt. Hood Medical Clinic. She also has helped screening hearing and vision at Welches Elementary School. She is working on her CNA certification so that she can work at Avamere in Sandy while attending MHCC. Congratulations to all of this year's Rotary Scholars! Last Saturday Rotary hosted 30 kids from Birch Community Services and My Father's House on a field trip to Evergreen Air and Space Museum in Mc Minnville. Rotarian Bob Avila organized the trip and was able to get the bus and driver donated from Students First Bus Company and 7-11 generously donated the box lunches. The museum provided a greatly reduced admission proce for the group. Gresham Rotary donated the funds to pay for the tickets. The kids were treated to a tour that included The Spruce Goose, the history of manned space flights, The Sprit of St. Louis, lunar and Mars rovers! 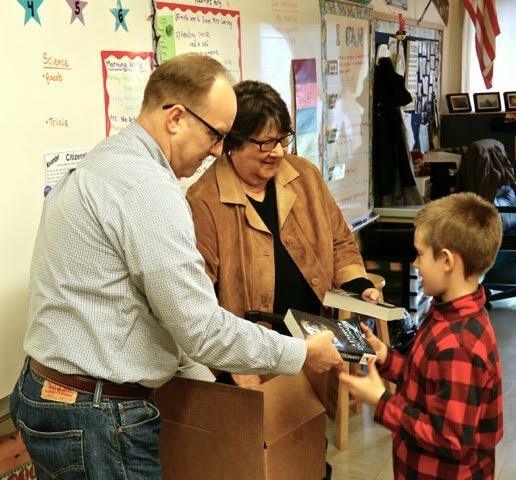 Gresham Rotarians are delivering over 800 dictionaries to third grade classrooms in Centennial and Oregon Trail School Districts this month. Gresham Rotarians Pete Eidenberg, Teresa Bright and Sam Breyer, Rotarian and Superintendent, are pictured here with a third grade class and their teacher at Butler Creek Elementary School. Over the past 25 years, Rotarians have helped immunize over 2 billion children in over 122 countries. For as a little as $.60 a child can be protected against this crippling disease for life. That is pocket change! 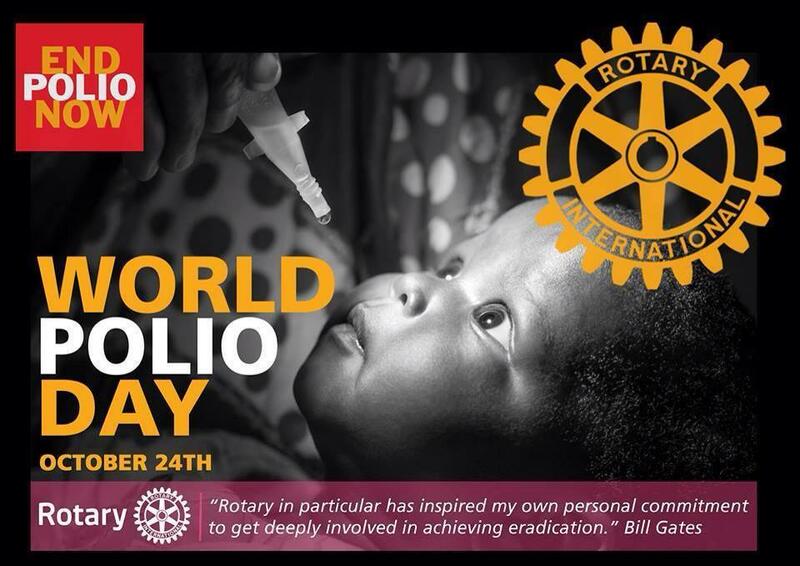 World Polio Day is October 24. Rotary clubs all over the world are planning fundraising activities during the month of October to help bring an end to polio once and for all in the next few years. We were all thrilled to see Andie Webb come in the door last Wednesday. Andie was a very active Gresham Rotarian heading up Literacy and the Wine Raffle and Auction, to name just a couple. Andie left us last year to take a position as the principal of a school in Amman, Jordan. It was great to see her. We wish she could stay longer so we could have her share her experiences on this new adventure. Gresham Rotarian and Assistant Governor, Carlos Noriega received his 6th Paul Harris at our club meeting last Wednesday. Carlos is a member of the Paul Harris society; meaning he contributes $1000 per year with a monthly automatic deduction from his checking account. An easy way to contribute to The Rotary Foundation. He is also a Bequest Society member, bequeathing $10,000 in his will when he passes on. 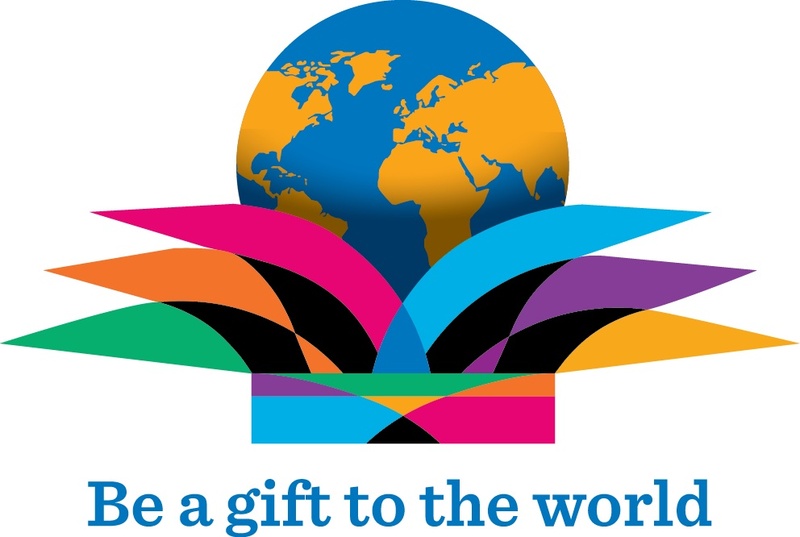 Another way, to support the good work Rotary does around the world. 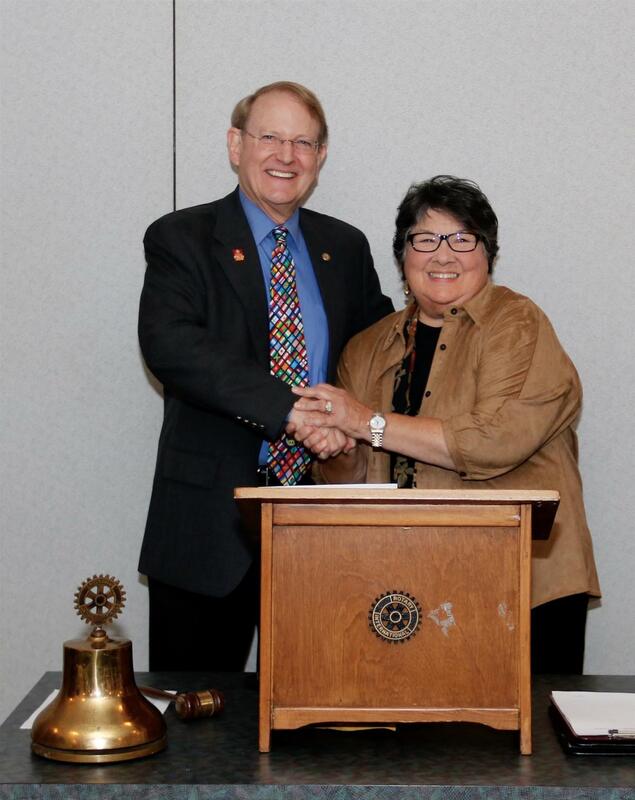 Meet our two newest members of Gresham Rotary, Janine Ross and Jamie Campredon. 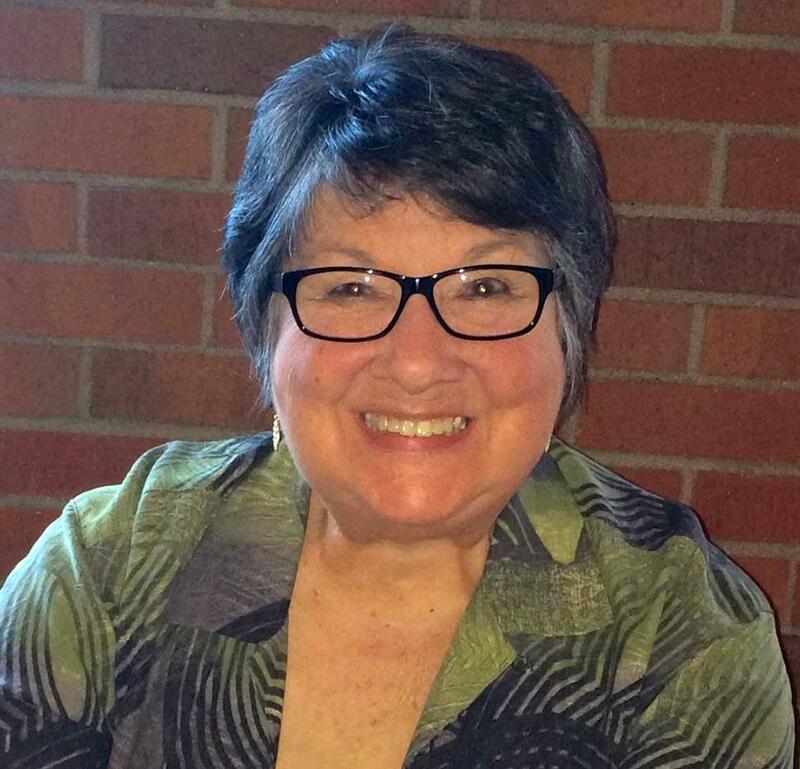 Jamie Campredon is the associate district manager for ADP services and a Rotarian transferred to our club from North Clackamas. Janine Ross is a branch manager of US Bank on Powell Blvd. Be sure to say hi and welcome to the club, when you see them at lunch! Good Luck and Good Golfing to everyone out at Persimmon participating in our Second Annual Golf Tournament. Golf Tournament today at Persimmon.